Woly Leather Balsam condition and nourish all leather goods Shoes Bags Furniture. 150ml bottle leather hide food with aloe vera to clean, condition and nourish all leather goods. INSTRUCTIONS FOR USE: Apply with a clean cloth and allow to dry, then polish to achieve maximum shine. Enjoy loud and clear sound with HAC. Feel secure and reassured with the assistance button on rear. Single core ARM processor. Weight 96g. 1000mAh battery capacity. Resolution 240 x 320 pixels. Technical specifications. Works on all colours. There will be variations in these lengths depending on personal preferences of how you like you laces tied. Tight, loose, long lace ends for bows or now the current fashion of no bows just knotting the laces and tucking the ends in the trainers. 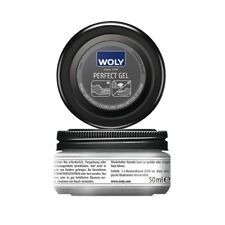 Woly Perfect Gel 50ml. Woly Perfect Gel. 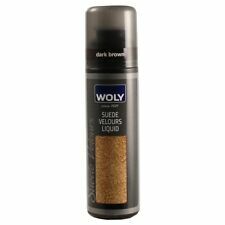 If you need to clean and condition your leather this Woly Gel is the ideal solution. Gently cleaning and conditioning after one simple application there really is no reason not to try this now. 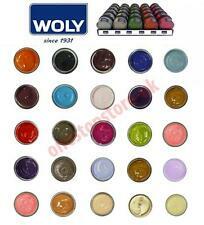 Woly 50ML Glass Jar Shoe Cream RRP: £5.99. High-quality specialist shoe cream for smooth leather. Original WOLY product. 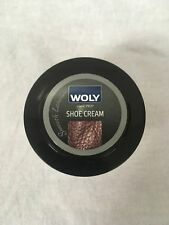 Professional shoe cream from Woly (50ml). Instruction for use: Remove dust and dirt from shoes.Apply sparingly and evenly onto leather.Allow to dry.Buff with a soft cloth or polishing brush. 1 x 75ml Pot of Leather Textile Whitener. Opaque white for leather and textile shoes. There will be variations in these lengths depending on personal preferences of how you like you laces tied. Tight, loose, long lace ends for bows or now the current fashion of no bows just knotting the laces and tucking the ends in the trainers. This product is NOT suitable for use on suede or nubuck. 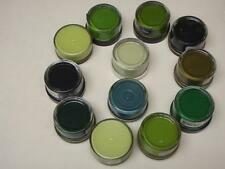 Is a leather cream containing wax that refreshes colors and provides a wonderful bright shine! In-depth effect penetrates deep into leather for cleaning, care and conditioning of leather. For use with all smooth leathers. Buff to a high shine if desired. 75ml bottle Similar to shoe cream but with added waterproofer. This will be of a similar tension, which you will use when you pull the laces to tie them. The exception being the cut to length leather lace/cord, where you are buying a length of your choice, which you can then cut into a pair of laces. 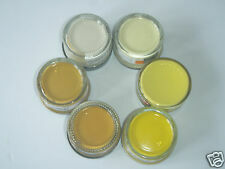 1 x Woly Shoe Cream Plus 50ml Jar. There are many benefits of using leather cream. The Black Shoe Cream provides a long-lasting black colour and a beautiful gloss finish. Shoe cream is suitable for all smooth leathers. Crepe Brush Combined Combination crepe brush Practical crepe brush made of high-quality natural crepe and synthetic side bristles for hard to reach areas. Cleans, dusts and smooths all types of suede leather. Suitable for smooth leathers, creams can be spread across the footwear, allowed to dry before being buffed to a shine and are a great way to recolour dull or faded shoes. Size: 50ml. Opaque colour polish. WAX COLOUR CLASSIC. Special stains remover for all rubust suedes and nubucks. 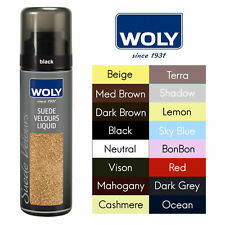 Woly Suede Velour Gum Shoe Cleaner. Woly Suede Velours Gum Dust Clean. For suede and nubuck footwear. 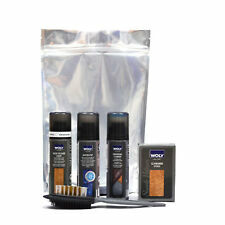 75ml bottle of Woly Waterstop protector liquid with integral sponge applicator. Suitable for use on leather; suede; nubuck & textiles. Woly Cleaning brush is a hard bristled cleaning accessory, to be used on majority of materials. Easy grip wooden handle. Woly Cleaning Brush Unisex-Adult Cleaning Shoe Brushes. A cleaning brush is a simple way to maintain your shoe's original box fresh quality! Apply the shoe cream to the leather using a soft cloth and rub in. Allow to dry before buffing with a brush and finish off with a clean cloth to polish to a high shine. Apply sparingly and evenly onto leather. 250ML Aerosol Spray. If your Suede shoes have started to fade and need the colour revitalising and conditioning there is only one option, this suede velour aerosol spray is available in a variety of colours and is perfect for all your suede shoes. Woly Lack Liquid Patent - Handbags Belts Neutral For All Colours. Woly Lack Liquid Patent. Cream, conditions the plastic surface leather. Good for handbags, bags, shoes, boots and all patent leather of imitation patent plastic to prevent cracks and keep a high gloss shine.